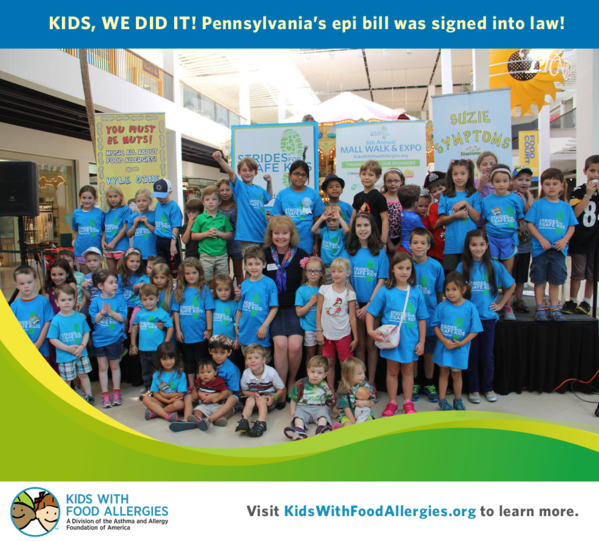 Thank you to all who took action to support epinephrine stocking in Pennsylvania schools! The bill HB 803, which allows schools to keep a supply of undesignated epinephrine auto-injectors for use in emergencies, has been approved by Governor Corbett. If a student experiences a severe allergic reaction (anaphylaxis), schools can now be better-prepared to treat the reaction with the necessary and life-saving medication. A huge thank you and congratulations is due to all the advocates and legislators in Pennsylvania who supported this law! This success would not have been possible without the support of advocates like you. Because of your efforts, schools in Pennsylvania can now be a safer place for children with life-threatening allergies.